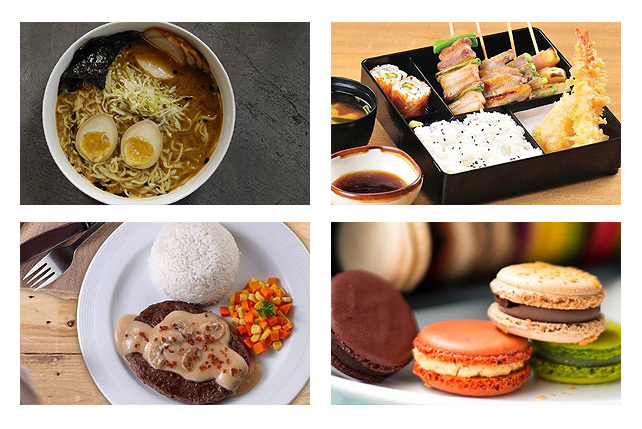 This Katipunan newbie offers students filling meals for less than P200. (SPOT.ph) Banquito is hardly fine dining, and with options like Crispy Sisig (P150) and Longganisa Burger (P150), a meal here is decidedly as casual as can be-light-hearted, level-headed-perfect for the students that the Cravings Group wants to attract. 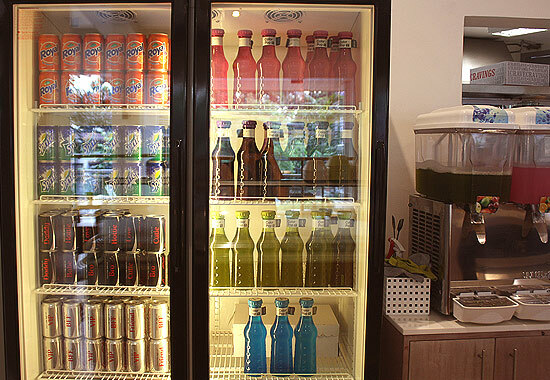 The white expanse on Esteban Abada, right behind the Center for Culinary Arts along Katipunan Avenue, is home to the school's experimental lab and library. Banquito takes up a small fraction of the ground floor: a cafeteria-style nook with wooden chairs that resemble desks (without the tables) and group-friendly seating with overhead shelves to get school bags out of the way and get right down to the eating-or, er, class project. Only a couple of items on the menu costs over P200-Fiery Shrimps (P220), for example, fresh shrimps, chilies, and rice in one plate. This much "extravagance," however, should be reserved for passing that Calculus exam. 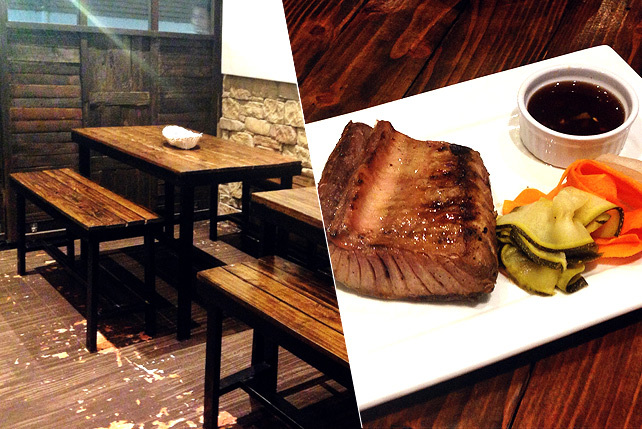 Other items on the menu are as pleasant albeit cheaper, served in heartier and equally comprehensive portions. Chef Jonathan Jota designed the menu himself, and the kitchen is staffed mostly with the Culinary Education Foundation's Cooking for Life Program (CLP) scholars. 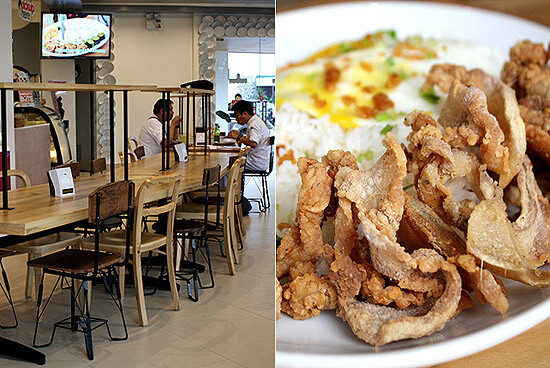 "The food here is the kind your mom or your yaya would cook for you," says the chef, hence, dishes like Tapa ni Mama (P165) and Tocino ni Yaya (P165). 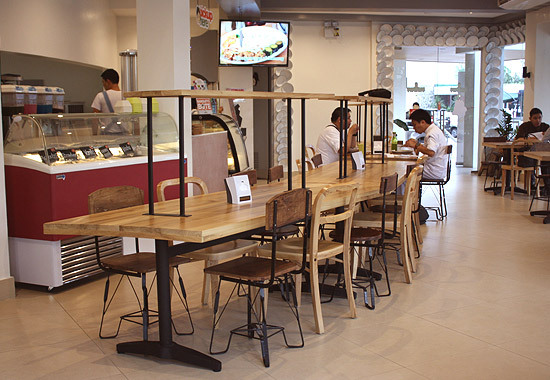 There's irony in finding home-style comforts in a restaurant, but that appeals to the vast number of dormitories and boarding houses in the area. 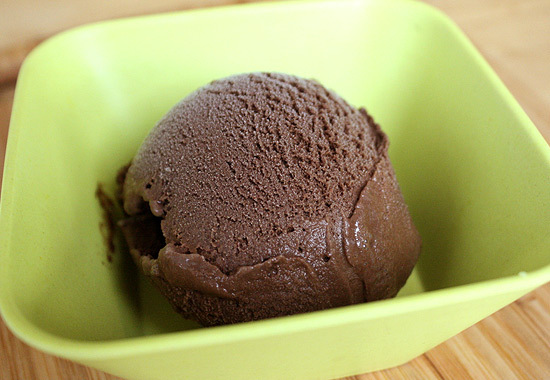 The bestselling Totoy Bibo (P220) is as close as you can get to eating at home. 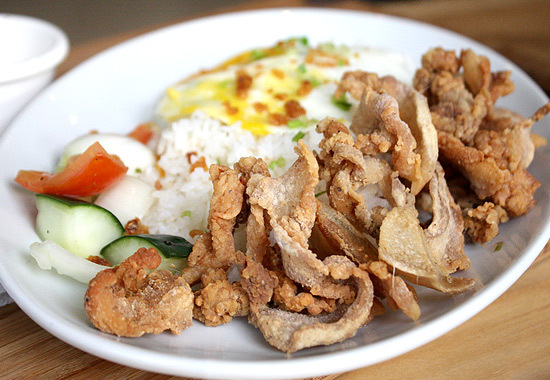 Bacon-cut pork belly are fried to a crispy, chicharon-esque quality and served with vinegar, sunny side-up eggs, and rice that is rightfully garlic. Chef Jonathan's Pork Giniling (P165) might as well be Banquito's version of arroz a la Cubana. 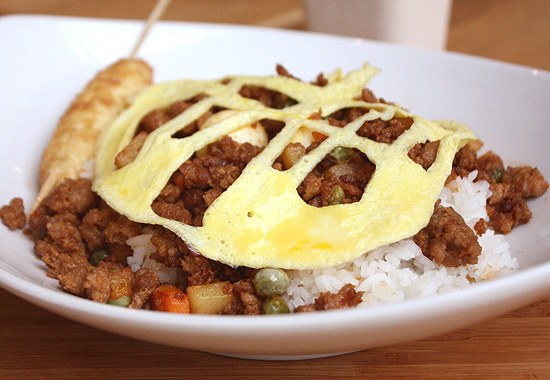 A mountain of rice, piled high with ground pork, green peas, quail eggs, and cubes of carrots and potatoes, is covered with a web of scrambled eggs. On the side is a small banana cue lightly covered with caramelized sugar. 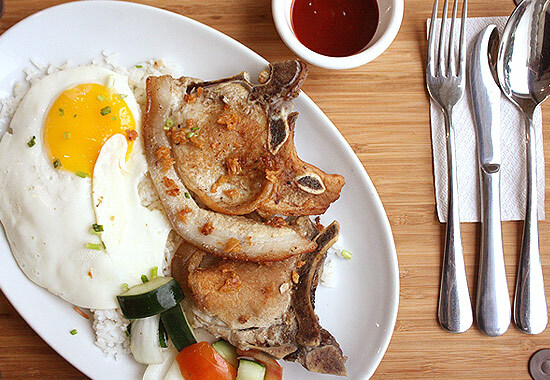 The Porky Chops (P199) are a pair of breaded, thin chops, also partnered with mountainous garlic rice, a fried egg, and some ketchup. It's not a far stretch of the imagination, but it no doubt satisfies. Buy the bottles, and re-use them for your next trip. 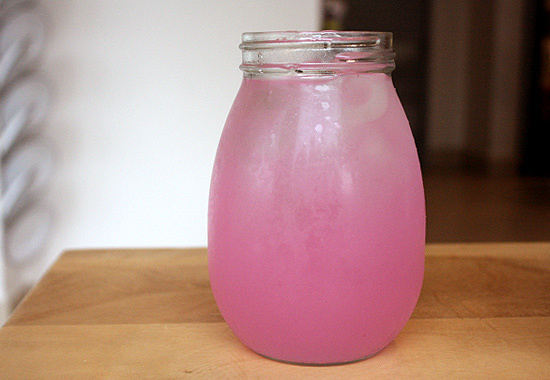 You get a discount on your drink! Orders are self-service, with customers being called whenever their dish is ready. 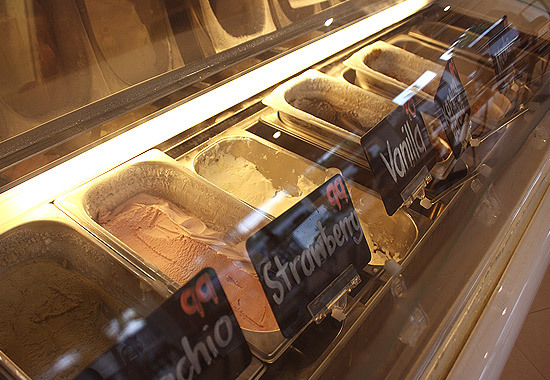 Make sure to walk past the ice cream and dessert displays. Everything is made in house, with inspiration from Filipino delicacies like a Leche Flan cupcake or Kapeng Barako gelato. It's a place developed for students-from the seating to the price range, but anyone who appreciates the value of money and the flavors of home would easily have a good time here.